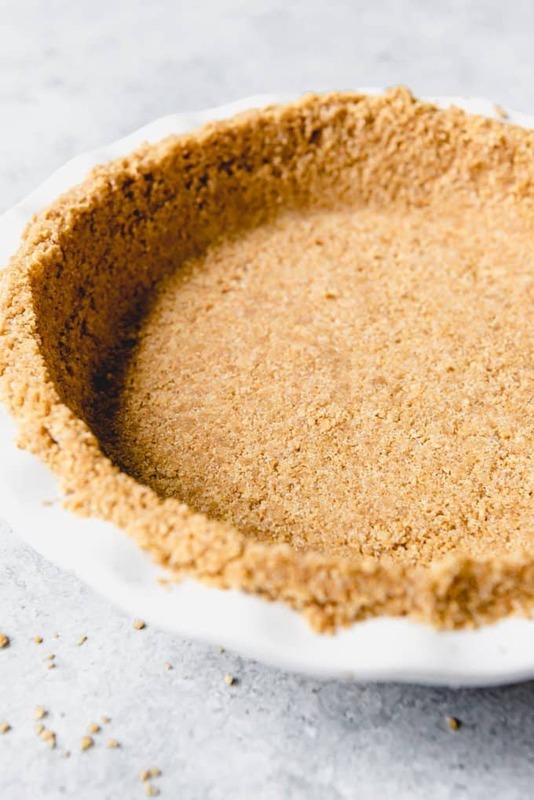 Never buy a store-bought graham cracker pie crust again by learning how to make a Graham Cracker Crust at home. It’s super easy, tastes better, and doesn’t fall apart like the store-bought graham cracker crusts. 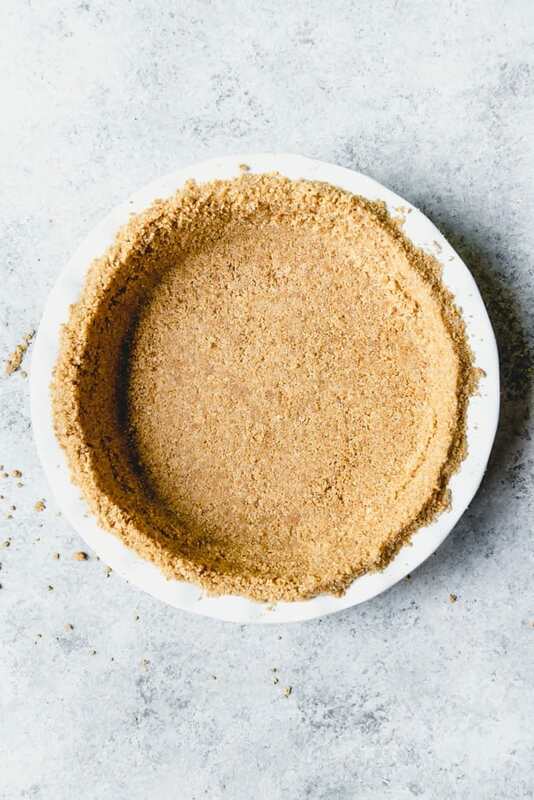 This easy graham cracker crust recipe is so basic, but it’s one I think every home baker should have in their arsenal. There’s something irresistible about a sweet, buttery graham cracker crust! The most frequently told story of my childhood by my parents is one involving graham crackers. As a kid (and now as an adult), I always loved graham crackers. Except I had this weird thing where I would only accept WHOLE graham crackers. If it had a corner broken off, I wasn’t having it. Even if my mom broke one in half in front of me to show that it really was the whole thing, I would throw a fit about it and refuse to eat the broken graham cracker. I only wanted the full sheets. It’s slightly embarrassing to admit that I still prefer the whole graham crackers and always pull them out of the sleeve for myself first before deigning to eat the broken ones now that I am an adult. So when I was 2 and the woman in front of my family at church was giving graham crackers to her young children to keep them content, my parents were worried when I started pleading to have one. The woman kindly turned around and offered one to me, only it wasn’t the full sheet. So I grabbed it and chucked it across the chapel. My parents were mortified. And that story is now legend in my family. Needless to say, I take all things graham cracker related, including graham cracker pie crusts, pretty darn seriously. That said, I’m not going to judge if you just find using the store-bought crusts more convenient. I’ve been there and done that myself. 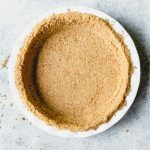 But there is almost no comparison between a fresh, homemade graham cracker crust and a store-bought one, and as long as you are going to the trouble of making a homemade dessert, you might as well knock it out of the park with this perfect graham cracker crust. And it’s only 3 ingredients – graham crackers, sugar, and butter – and takes all of 5 minutes to throw together, so….. I made this particular graham cracker crust for key lime pie specifically. 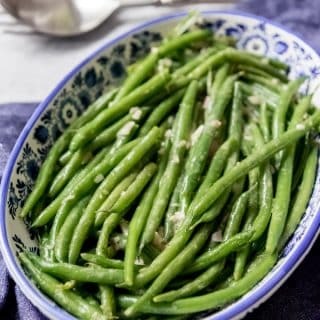 But it can be used with almost any pie recipe you want, especially if you aren’t a fan of traditional pie crust made with flour, fat, salt, and water that gets rolled out and baked. 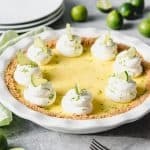 Use graham cracker crust recipe to go with sour cream lemon pie, banana cream pie, chocolate cream pie, fresh strawberry pie, no bake cherry cheesecake, ice cream pie, and so many more desserts. Or bake up a crust, then break it into chunks and sprinkle it over ice cream or mix it into brownie batter! Crush graham crackers into fine crumbs. 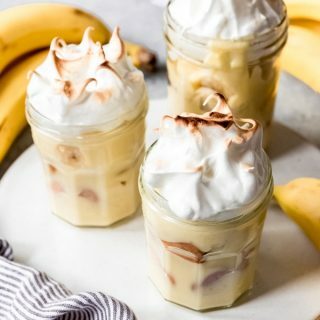 A food processor will make this a snap, but you can also use the old-fashioned method of a large ziploc bag and a rolling pin. Combine graham cracker crumbs and sugar in a large bowl and stir together with a fork. 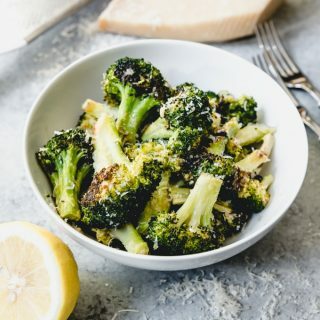 Drizzle melted butter over the crumbs, stirring with a fork until the crumbs are evenly coated. 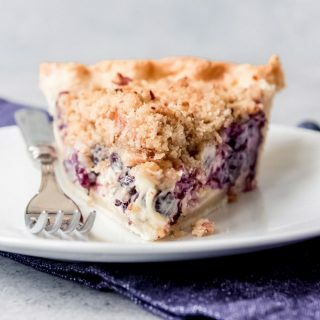 Dump the crumb mixture into a pie plate or springform pan and press into the sides and bottom using your hands or the bottom of a glass or measuring cup. Bake at 350 degrees F for 10 minutes, then cool completely before filling. 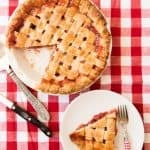 Or for a no-bake pie and pie crust, just chill for 1-2 hours until set. How do you make a graham cracker crust stick together? Butter is the only binding agent in a graham cracker crust, so if you have had problems with your crust sticking together, it’s most likely the result of the butter to graham cracker crumbs ratio being off. If you decide you want a thicker crust, you can’t just add more crumbs (say 2 cups) without simultaneously increasing the butter. 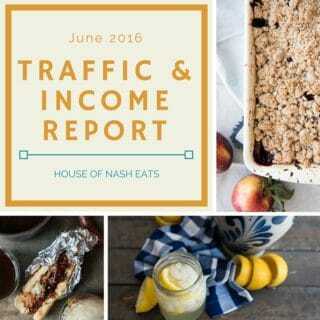 At the same time, you don’t want to make your crumbs soggy with melted butter. Another important part of getting the graham cracker crust to stick together is to apply some pressure to it. I always use a glass to do this, tamping and packing the crumbs together, but a flat-bottomed measuring cup works perfectly well also. The final step is to set the crust either by baking or chilling. Baking the crust will melt the sugar and help bind the crust together. Chilling with cause the butter to firm up again and help the crust hold together. The short answer is no. 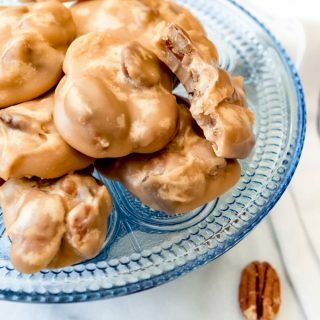 You could just make the crust and press it into a pie plate or springform pan, then chill in the fridge for an hour or two to firm up for an easy no-bake graham cracker crust. But I think it tastes best when baked. 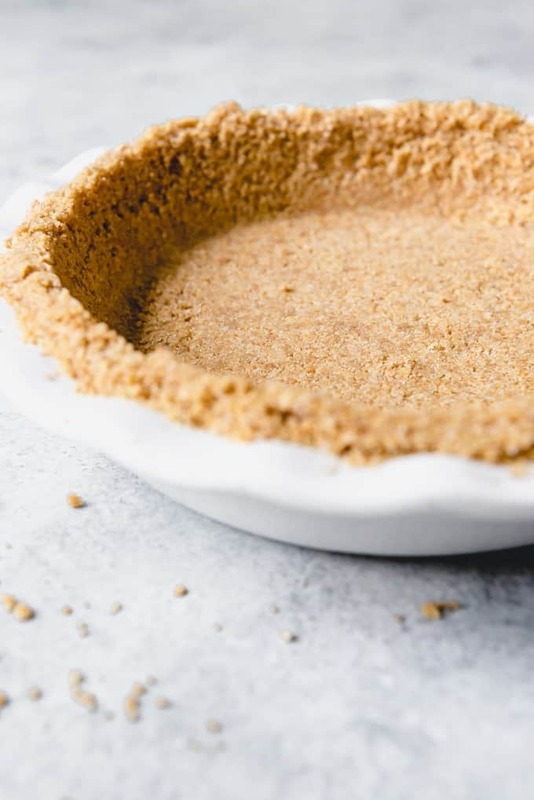 It not only helps the crust set up and be sturdier, which is great for cream pies, but I also love the slightly nutty, toasty flavor it takes on after baking the graham cracker crust. You can buy boxes of graham cracker crumbs, which saves the step of crushing them yourself. Or just empty 1 1/2 sleeves of graham crackers (it’s about 11-12 full-size graham crackers) into a plastic bag and crushing them with a rolling pin. This was my favorite job when I was a kid and now my kids LOVE this job as well. Or you can dump them in a food processor and pulse until fine. For the record, I always use Honey Maid graham crackers by Nabisco. Exclusively. This post isn’t sponsored by them or anything, I just think they are the best graham crackers and prefer a Honey Maid graham cracker crust over a Keebler graham cracker crust. I mix my crust using only a fork. 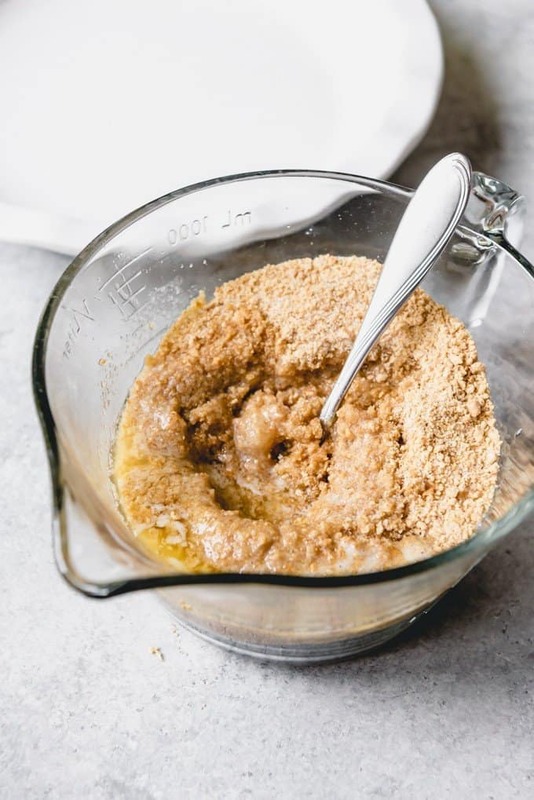 First I stir the graham cracker crumbs and sugar together, then drizzle the melted butter over the top and continue to stir with a fork until everything is combined evenly. 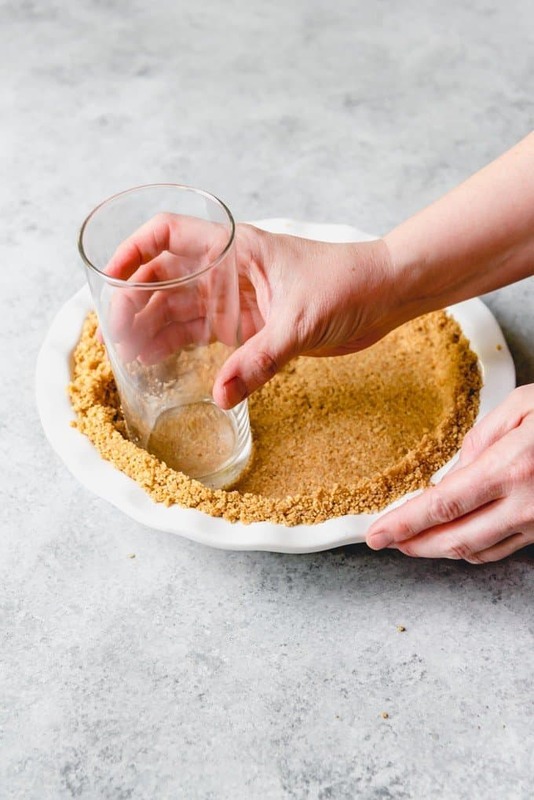 Press the crust into the pie plate or springform pan using the flat bottom of a measuring cup or drinking glass, making sure to also press the sides. 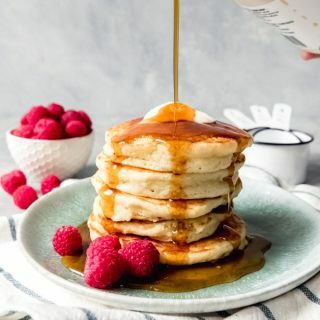 You may need to use your hands, especially on the sides, to press it well, but if the ingredients were measured correctly there should be enough moisture from the melted butter for the crumbly crust to stick together with a little pressure. Sub the graham crackers for Nabisco Famous Chocolate Wafers, chocolate graham crackers, or Oreo cookies to make a chocolate crust. Or change up the flavor by adding 1/2 teaspoon of cinnamon to the crust. 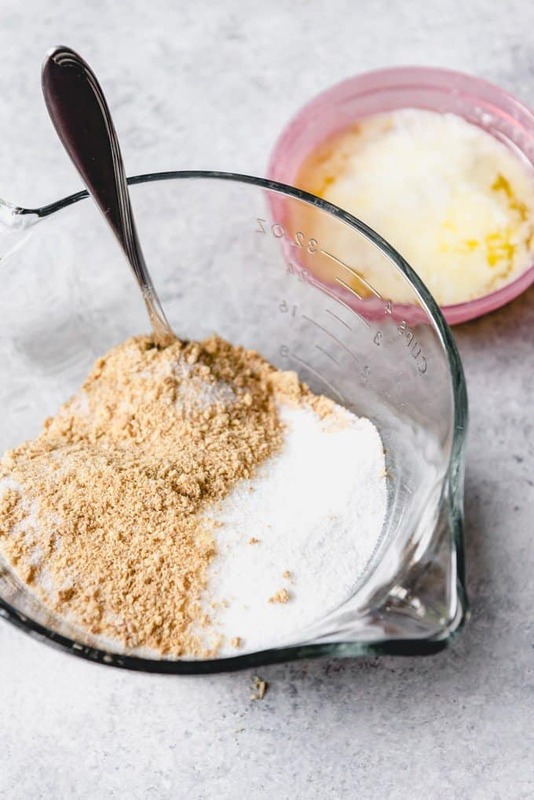 For an 8- or 9-inch cheesecake, you might want to decrease the ingredient amounts to 1 1/4 cups crumbs, 1/4 cup sugar, and 5 tablespoons butter depending on whether you are planning to have the crumbs go up the side of the cheesecake or just press it into the bottom. Unless you want a really thick graham cracker crust, which sounds pretty perfect to me. Never buy a store-bought graham cracker pie crust again by learning how to make a Graham Cracker Crust at home. It's super easy, tastes better, and doesn't fall apart like the store-bought graham cracker crusts. 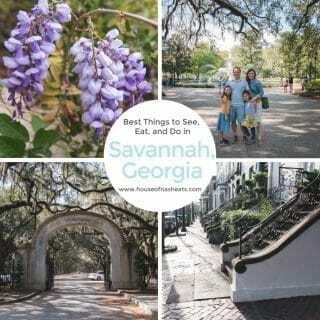 Finely crush graham crackers in a food processor or by placing them in a ziploc bag and rolling with a rolling pin. In a large bowl, combine graham cracker crumbs and sugar, mixing with a fork. 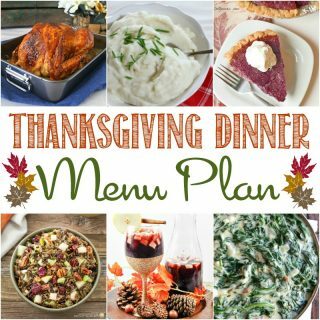 Drizzle melted butter over the crumbs and stir with a fork until crumbs are evenly moistened. 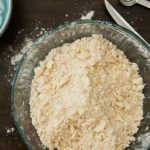 Press mixture into a 9” pie plate using the bottom of a measuring cup or glass. You may need to use your fingers to press the sides until compact. For a baked graham cracker crust: Bake at 350°F for 10 minutes or until the crust is lightly browned just around the edges. Cool completely before filling. For a no-bake graham cracker crust: Chill for 1-2 hours before filling. 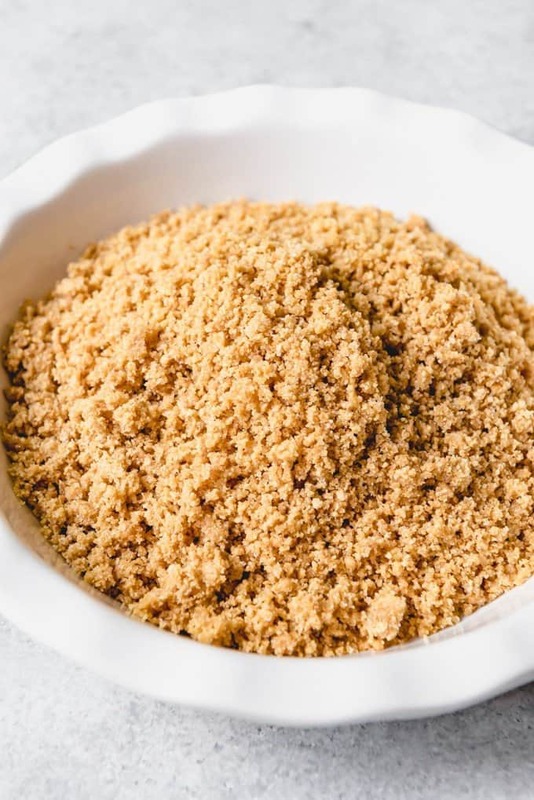 For a slight flavor change, you can substitute an equal amount of brown sugar for the granulated sugar, or add 1/2 teaspoon of ground cinnamon to the graham cracker crumbs. Thanks for the excellent instructions, I’ll be pinning this for future use!